Why is the Bluebird the New York State Bird? 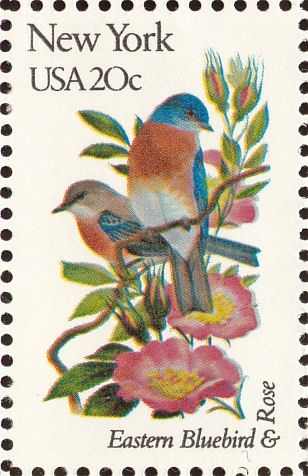 New York, the aggressive forerunner in so many ways, was the last state in the Union to acquire an official state bird, and it was not until May 18, 1970, that Governor Rockefeller signed a bill elevating the eastern bluebird (Sialia sialis) to a select group of twenty-nine species representing the forty-nine states. Seven eastern states share the cardinal, the bird most heavily favored; six western states have the meadowlark; and five in Dixie claim the mockingbird. New York shares the eastern bluebird with Missouri. A second bluebird, the mountain bluebird, is the choice of another pair of states – Idaho and Nevada. There is no confusing the two birds, however. The eastern bluebird is a lowland dweller with a reddish breast and a cheery warble, while the mountain bluebird stays at altitudes greater than a mile and is, except at dawn, a remarkably silent creature. State birds are usually selected for their historical associations, economic value, beauty of song. Alabama, for example, chose the flicker because its yellow, black, and red feathers were the colors worn into battle by various of the state’s contingents in the Civil War. Utah’s California gull rendered crucial service to the earliest Mormon settlers during the first spring after their arrival; it devoured hordes of locusts that were eating the first crop of grain as it sprouted. And South Dakota’s ring-necked pheasant – not a native, in fact, but a bird of Asiatic origin – annually draws to the state thousands of hunters, who leave there large quantities of money. Ordinarily, state birds are adopted by acts of legislatures, or gubernatorial proclamation. A few, however, have become official by tradition or other means. The brown pelican, the largest state bird, whose wingspread can be an awesome nine feet, is considered Louisiana’s state bird because it adorns the state seal, approved in 1902. This is also the method by which the bald eagle has become to be the official bird of the United States. In 1782, Congress voted to put the eagle in the country’s great seal. Action on state birds has typically been initiated by a state’s Federation of Women’s Clubs, aided and abetted by conservation groups and public school authorities. The nineteen-twenties and thirties were an especially active time – thanks in large measure to Mrs. Katherine B. Tippetts, of the General Federation of Women’s Clubs, in Washington D.C. At her suggestion, women’s clubs in states lacking an official bird placed the names of favorite birds on informal ballots, which were distributed as widely as possible, particular attention being paid to the schools. “The state bird itself is really less important than the thought and discussion involved in the selection,” Mrs. Tippetts has said. A number of states had already set aside a Bird Day for avian study and appreciation, and the state-bird vote was announced on Bird Day. New York’s first Bird Day was on April 2, 1915, an occasion that in due course (as environmental study broadened) was incorporated into Arbor Day and Wildlife Day, and in recent years has become simply Conservation Day. On April 13, 1928 – that year’s Bird Day – it was revealed that the bluebird had won an informal referendum held under the direction of Mrs. Charles Cyrus Marshall, of the New York State Federation of Women’s Clubs. Runner-up was the robin, honored today as the state bird of Connecticut, Michigan, and Wisconsin. Official action usually follows the popular vote within a year or so, but the bluebird languished as New York’s unofficial bird for forty-two years, the longest unofficial-state-bird tenure on record. A decisive move to correct this situation was made in the spring of 1969, when Mr. and Mrs. Allen Christopher, of Marathon, in Cortland County – excellent bluebird terrain – asked their assemblyman, George M. Michaels, of Auburn, to do something about getting legislation passed to make the bluebird’s status official. Mrs. Christopher and her husband, who run a home-and-garden-supply store, are active amateur ornithologists and had just attended a convention of the Federation of Bird Clubs of the State of New York, held in Marathon, where the long-standing neglect of the bluebird had been noted with more than a little asperity. Michaels explained that it was too late to introduce a bill in 1969, but promised to do so the following year. All did not go quite as smoothly as it had in the Senate, however. An opponent materialized. Seymour Posner, Democrat of the Bronx, rose and said, “Mr. Speaker, I have some misgivings about the particular bill.” He pointed out that city dwellers, of which he was one, knew the sparrow and knew the pigeon. “But I think it is premature to talk about the bluebird,” he said, “because, very frankly, the bluebird is not a bird that is well known. Who has seen a blue jay – bluebird, whatever they are – who has ever seen a bluebird except on greeting cards, and people who live in rural America? People who live in the lower East Side and West Side and North Side and South Side – how are we going to go along with a bird we never saw?” Despite Posner’s antagonism, however, the bill passed – a hundred and forty-four to one – and in due course was sent along to the governor. Those present two months later at the signing report that he affixed his signature rapidly, with no outward show of emotion. Assemblyman Posner had a point. It is, as a matter of fact, highly unlikely that most people who live in this city will ever see a bluebird, unless they journey to the American Museum of Natural History, where there is a mounted specimen of our state bird in a display entitled “Birds of the New York Area.” The reason a city dweller and a bluebird are unlikely to meet is a matter of habitat. City residents tolerate crowding, noise, pollution, and the substitution of concrete for greenery. The bluebird, which is slightly larger than a sparrow and has a poor, round-shouldered posture when perching, prefers quiet and rural surroundings. It is, in effect, a bird of another era. In the vanished Currier & Ives landscape of an America of long ago, when the ice was going from the lake and patches of snow still lay in the forest the bluebird was one of the first to greet the plowmen venturing into their fields. A nineteen-century poet described its coming as ” a rumor in the air for two or three days before it takes visible shape.” Its back the purest blue, matching the cloudless shy, its red-brown breast the color of the awakening earth, the bluebird was the gentle symbol of spring for a gentler land. Three hundred and fifty years ago, it reminded the Pilgrims of the chunky robin redbreast they had left behind in England, and they called it the blue robin. Editor’s Note: This article was excerpted from a larger article with the same title and appeared in the New Yorker magazine (December 24, 1973). We thank the New Yorker for granting permission to reprint it. The above article was in NABS Sialia, Winter 1980.